from getting the lay of the land to keeping a trough-load of tricks up your sleeve. Cheers! 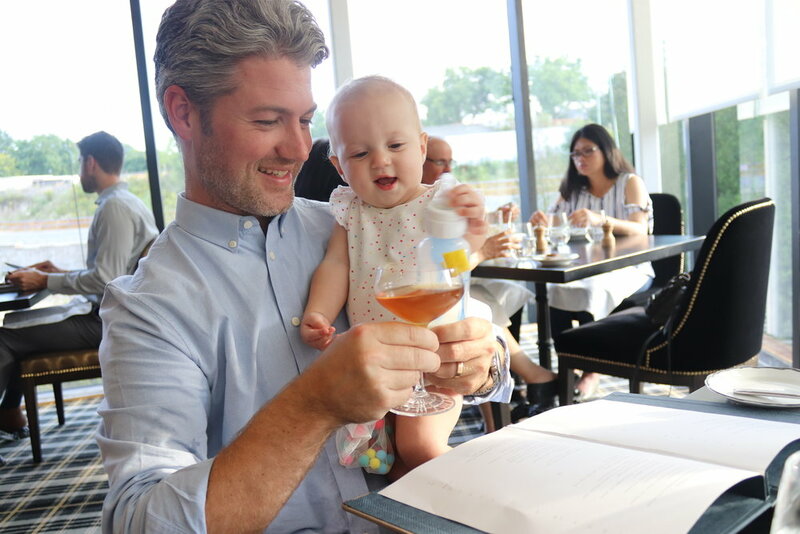 At the new Elora Mill Restaurant, an hour outside of Toronto, we dressed up, dined at 6, and took this little lady out of the dining room anytime she fussed. Call in advance and ask about the best family friendly tables, perhaps in a lively bar area or on an outdoor patio. The right setting can make the occasional kiddie squeal less cringe-worthy. Is your kid acting up? Take them outside for a breather. They can burn off some energy, and you won’t disturb other diners. Will your three-year-old spill all over his new button-down shirt? Yes. But you should still put it to use, and—just like on an airplane—an adorable outfit might earn you a few encouraging smiles from neighboring tables. A few board books and the promise (or bribe?) of chocolate ice cream kept Thomas engaged for an entire lunch at the upscale June's All Day in Austin. Dining out teaches kids about different foods, social and cultural norms, and table manners and conversation. It may be hard to appreciate this as they pick every fleck of basil out of their pasta, but the more you do it, the easier it becomes. Take heart in the fact that parents often dine out with their kids in other countries. Unlike in the U.S., where showing up with a kid at a non-chain restaurant can feel embarrassing, family dining is expected in places like Mexico and Italy. At Ottolenghi in Spitalfields, London, where we dined at 2:30 to avoid the lunch rush. Think twice before handing your kiddo an iPad or cell phone, especially in certain countries like France where the practice isn’t common. Restaurants are a great places to brush up on manners and practice the art of conversation—even if it is about super heroes and rocket ships. Have more tips? Give me a shout below.